Development team: The people who create the product. Programmers, testers, designers, writers, and anyone else who has a hands-on role in product development are development team members. Product owner: This person is responsible for bridging the gaps between the customer, business stakeholders, and the development team. The product owner is an expert on the product and the customer’s needs and priorities and helps clarify project requirements. Product owners make the decisions about what the product does and does not include. Add to that the responsibility of deciding what to release to the market and when to do it, and you see that you need a smart and savvy person to fill this role. Scrum master: This scrum team member is responsible for supporting the development team, clearing organizational roadblocks, and keeping processes true to agile principles. A scrum master is different from a project manager. Teams using traditional project approaches work for a project manager. A scrum master, on the other hand, is a servant-leader who supports the team so that it is fully functional and productive. 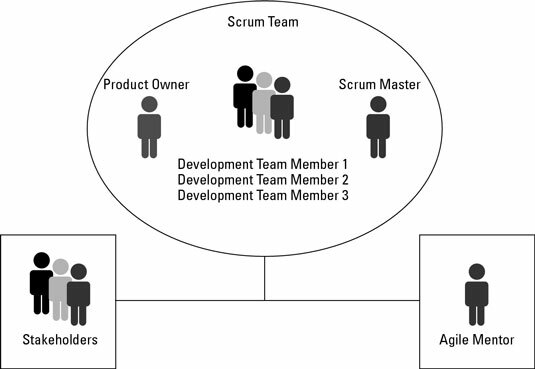 The scrum master role is an enabling role, rather than an accountability role. Stakeholders: A stakeholder is anyone with an interest in the project. Stakeholders are not ultimately responsible for the product, but they provide input and are affected by the project’s outcome. The group of stakeholders is diverse and can include people from different departments, or even different companies. Technical people, such as infrastructure architects or system administrators. The legal department, account managers, sales people, marketing experts, and customer service representatives. Product experts besides the product owner. Stakeholders may help provide key insights about the product and its use. Stakeholders may work closely with the product owner during the sprint and give feedback about the product during the sprint review at the end of each sprint. Agile mentor: Someone who has experience implementing agile projects and can share that experience with a project team. A mentor is a great idea for any area in which you want to develop new expertise. The agile mentor can provide valuable feedback and advice to new project teams and to project teams that want to perform at a higher level. The agile mentor is an agile expert with significant experience in implementing agile techniques. Not a part of the scrum team, a mentor is often someone from outside the organization who can provide objective guidance, without personal or political considerations.